Tired of having to ping this #&%@* thing? Automatically ping this target from 20+ locations outside your network and see availability and performance the way your users see it. Know when there is a problem before your users do. Free alerts for 30 days. Network connectivity matters. Ping test websites, servers and network speed from over 20 locations around the world. The dotcom-monitor instant ping test sends ICMP packets to the host and measures response time and logs any errors that occur. Please note: it may take a few moments to complete your ping test from all locations depending on the number of tests running at this time. Our free ping test allows you to check the response time of websites and servers from dozens of locations around the world. The pingtest works by sending ICMP packets to the specified host address to measure response times and detect errors from 20+ monitoring locations, giving you a global view of the host's availability and performance on the internet. After sending the packets, the ping test reports back the duration of each ICMP ping request along with a status of the request (success or failure). If the status of the ping is a failure, the system reports back an error code and an error description (such as a DNS error with an error code of 12007). The ping test tool helps to quickly see locations or regions around the world that may be experiencing slowdowns or outages at a glance. Both the ping test and the traceroute tools are online versions of commonly used desktop troubleshooting tools. The difference between the desktop tools and these online pingtest tools is that you can run a ping test directly within your browser, and the test will be performed from all of the above listed locations simultaneously. This gives you an external view of your website and server response time. With an external view, you can easily identify potential problem areas that may be experiencing errors or other issues. If you want to schedule an automated ping test, traceroute test, or any other recurring diagnostic tools, you can sign up for a free 30 day trial. Try Free for 30 Days Get started in 60 seconds. No credit card, no commitment. This ping test is not only useful for determining whether a website is up or down, but it can be used to establish baseline performance metrics. 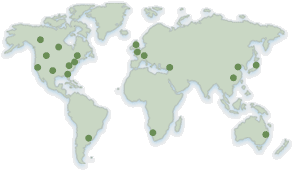 By running several ping tests you can identify average server response times from different locations around the globe. These baseline performance numbers can later be used in conjunction with our other free tools on this site to monitor how a web server's performance changes over time and under different loads. To help answer the question "what is load testing" we have a comprehensive performance testing resource here. For more advanced analysis try some of our other free tools such as: traceroute test, DNS lookup, the website speed test, email server, blacklist test and even a streaming media test. Ultimately, if you are looking for something more than a one-off test, you should sign up for a free 30 day trial of the Dotcom-Monitor suite of website monitoring tools. Dotcom-Tools.com is a suite of free network troubleshooting tools created by Dotcom-Monitor to help website and network administrators optimize, troubleshoot and maintain the best online performance possible. At Dotcom-Tools, you can run checks beyond a simple ping test, such as testing server response time, website page load speed, streaming media uptime and more-all for free. These free tools at Dotcom-Tools are a subset of the subscription based tools available at Dotcom-Monitor.com. Our paid suite of tools take the pingtest and other free tools to the next level, allowing you to schedule ongoing monitoring of your websites, servers and infrastructure as frequent as every minute from locations around the world. Some of the additional functionality at Dotcom-Monitor include scripting user interactions with a website, Rich Internet Application interaction with technologies such as Flash, Flex, Ajax, Silverlight and more, email server monitoring including round-trip and ActiveSync monitoring, VoIP phone system monitoring and much more! With over twenty-five products in the Dotcom-Monitor suite of monitoring and troubleshooting tools, there is definitely a tool that will help you substantially improve the performance of your application, network, or website. For more information on setting up ongoing subscriptions to monitor your network infrastructure visit Dotcom-Monitor today! © 1998-2019 dotcom-monitor is a registered trademark of Dotcom-Monitor, Inc.